:A.^ Extended from 2,180 m (7,152 ft) in fall 2009. Narita Internaitional Airport (成田国際空港, Narita Kokusai Kūkō) (IATA: NRT, ICAO: RJAA), kent as Tokyo Narita Airport an aw, is the primar internaitional airport servin the Greater Tokyo Aurie o Japan. 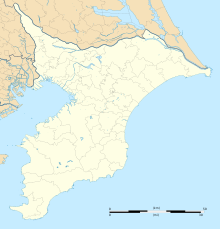 It is locatit 57.5 km (35.7 mi) east o Tokyo Station an 7 km (4.3 mi) east-sootheast o Narita Station in the ceety o Narita in Chiba an the adjacent toun o Shibayama. Narita handles the majority o internaitional passenger traffec tae an frae Japan, an is a major connectin point for air traffec atween Asie an the Americas an aw. The airport handled 35,478,146 passengers in 2007. It is the seicont-busiest passenger airport in Japan, busiest air freight hub in Japan, an nint-busiest air fricht hub in the warld. It serves as the main internaitional hub o Japan's flag carrier Japan Airlines, All Nippon Airways, Nippon Cargo Airlines, an law-cost carriers Jetstar Japan an Vanilla Air. It serves as a Asie hub for Delta Air Lines an United Airlines an aw. Unner Japanese law, it is classifee'd as a first cless airport. Wikimedia Commons haes media relatit tae Narita International Airport.